What makes MobileMe worth £59 a year? 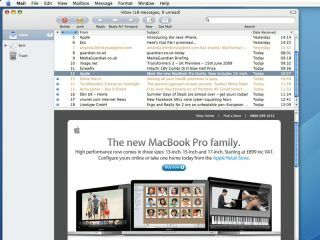 Can Apple justify charging for email and syncing? MobileMe certainly claims to offer its punters a lot but is it worth it? Apple's suite of online services made headlines last year when it changed its name from .Mac to MobileMe. Not because anyone cared what it was called, but because the revamp went so badly that the internet resounded for months with the caterwauls of dissatisfied users. To cut a long story short, MobileMe is now fixed and does all the things it was supposed to – syncing your email, contacts and calendars between devices; hosting websites; storing and transferring files, and creating online photo galleries – without falling over. Which is nice. But are those things enough to justify the asking price of £59 a year? Let's take a closer look at what you get for your cash. MobileMe's best trick is 'push'. When someone sends you an email, it pops up immediately on your iPhone or iPod touch, wherever you may be (that's if you've got a Wi-Fi connection or, with the iPhone, O2 reception) cutting out the need to waste time and battery checking every few minutes just in case. Any changes to Address Book or iCal are also transferred. It all works the other way round as well, so contacts and appointments you add on the move are immediately reflected on your Mac. Emails appear on the iPhone faster than texts, sometimes within one second of being sent. In fact, syncing can be almost too fast: click the To Do icon in OS X Mail, and the new item appears on your iPhone before you've even typed what it is you have to do. The only limitation is, as far as we can establish and despite claims to the contrary, that MobileMe doesn't push to your Mac – Mail still has to check the server at preset intervals, set in Mail > Preferences > General. It's incredibly convenient to know you'll see the same messages, contacts and calendars on your main Mac and iPhone or iPod touch, any other Macs running Mac OS X 10.4.11 or later and PCs: MobileMe can also sync Microsoft Outlook and Windows Address Book, and a MobileMe Control Panel is installed in Windows as part of the iTunes download (the latest version is 1.4). MobileMe isn't the only way to sync, though. Google Mail, for example, can also sync and push to Macs, PCs and iPhones, and Google Calendar and Contacts can join the fun too. However, while setting up MobileMe is as easy as entering your member name and password, Google's tools take a bit more effort if you want to get them to sync. It's not impossible, but there's a fair bit of headscratching involved before it typically runs smoothly. If you get your work email from a Microsoft Exchange server, you can get email pushed to your iPhone or iPod touch by setting up an Exchange ActiveSync account, as explained here. However, you can't have it both ways: mail can only be synced from MobileMe or Exchange, not both. (With contacts and calendars, both systems can coexist but won't merge with each other.) If you use, say, Exchange for work and MobileMe for personal email, a solution is to sync one and set the other to forward all mail to that account.